So, I know that I said I’d be away for a bit. But I’ve been at homework for 17 hours straight now (including Blackboard wiping my test clean and a professor pulling reference information off the website). I’m a little…stressed. Just a bit. Yeah. Since it’s Monday, I thought I’d share some of the music that is getting me through the week. Sarah first introduced me to Mumford and Sons a few weeks ago because of the song Sigh No More. Being the awesome English major that she is, she was quick to point out the major selling point: the words to the song were taken from Shakespeare’s Much Ado About Nothing. Well, that right there is enough to win my heart! Besides, look at that crazy arrangement of strings! Bass, cello, violin, viola, drums, guitar, banjo, etc…right there we are looking at something unique. A week or two after this, one of my classmates chose their song The Cave as the topic for his paper. Sitting in a drab university room, the words really hit home with me…and I think with a lot of us sitting there overall. This one is a little rawer than Sigh No More, but excellent in its reality. you know the maker’s land. It’s good stuff there…a little rough, but good. I like the fact that their lyrics can be honest, yet they still find a way to make them hopeful. If you are looking for a slightly mellower sound from them, I have two more for you. The first one has a beautifully British title: Thistle & Weeds. The other one I love is Awake My Soul. It’s laid back and lyrically poignant. Caveat time: there is one song of theirs that made me unhappy with them. It’s called Little Lion Man, and despite all the awards it’s won, I don’t see any good excuse for the word they used throughout the chorus. So, I just want to make it clear that I am NOT endorsing that particular song. The others…well, they are just really, really good. 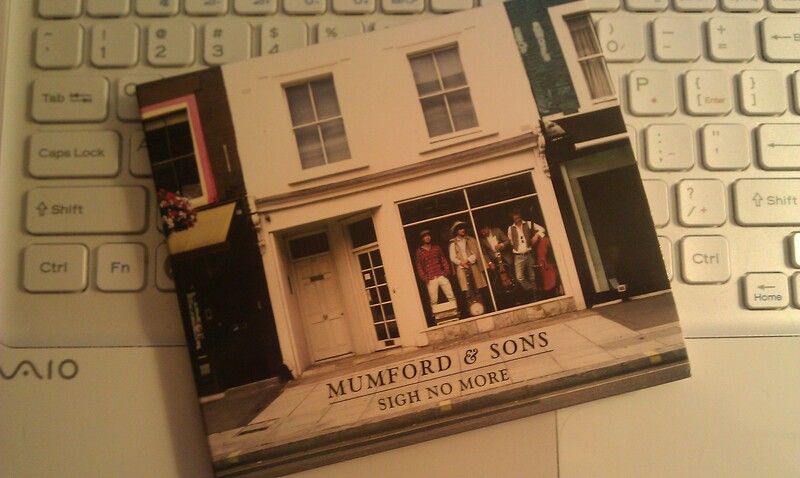 Oh, and you can now pick up the album Sigh No More at your local Starbucks! And, you can hear the songs there too! It’s a nice change from some of the weeping and wailing we’ve had in the stores recently. There you have it. I hope you enjoy…and have a good week.